Latest updates to the junior colour and participation badges, updated to include events so far in 2019: Glen O' Dee, British Night Champs, SOL 1 Birsemore, Torphantrick, Glen Dye and the Deeside Night Cup events. Latest standings after the events at Glen O'Dee in January and the Birsemore SOL in February are here. Next event which counts for the JD2C is the event this Sunday at Glen Dye. Weather forecast is good and a nice area so get out there and score some points! Check the Gramp website for info on the road closure approaching Strachan from the west. The Jon Duncan Dunior Deeside Cup (JD2C) is a points competition for Juniors of MAROC and Grampian Orienteers which runs each calendar year. The competition this year will be run over 9 events and is already underway with the event at Glen O'Dee on Sunday. The full list of fixtures is in the table below and this along with summary of rules in the attached. Prize giving for the competition (the much coveted wooden statues) will be at the GRAMP And MAROC Club AGMs. If you are not sure of the age class that you should be running in, this is tied to your year of birth, so effectively your age at the end of 2019 - see the attached table. With apologies to those affected, belated posting of revised Final standing for the JD2C. Congratulations again to the category winners below as well as to all medal winners in the attached full table. Latest updates to the junior colour and participation badges, updated to include the recent event at Bogendreip. 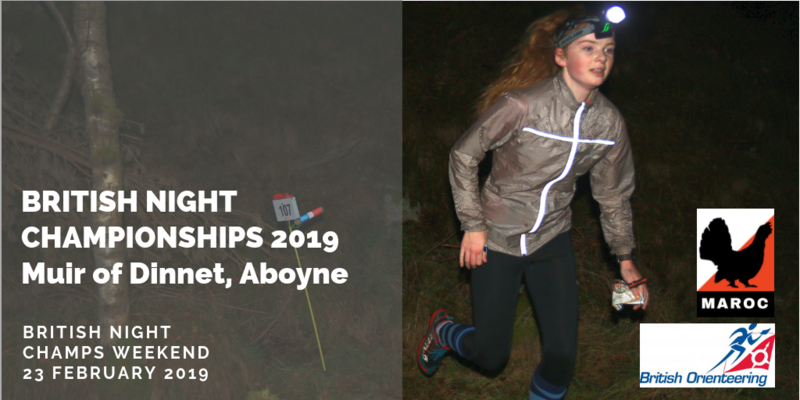 The British Night Orienteering Championships are coming to Deeside on the weekend of February 23rd - 24th 2019. As well as the Night Chamionship event itself on Saturday evening, there will be a SOL at Birsemore on the Sunday and a SOUL sprint event organised by Grampian Orienteers at Cove earlier on the Saturday. Latest JD2C standings updated after the event at Scolty on Sunday 14th October. Final (JD)2C event is at Bogendreip on this coming Sunday, 4th November. Reminder that the BTO SOUL 8 event is taking place on Saturday 15th September at Danestone. Using the Danestone/Grandholm area to the northwest of the city centre and based in Danestone Community Centre, courses are full length urban style mainly on paths through the housing estates, some grassy open areas and woodland. Online entries are now open via Fabian 4 and full details can be found on the GRAMP website. Full details and reminder of rules here.